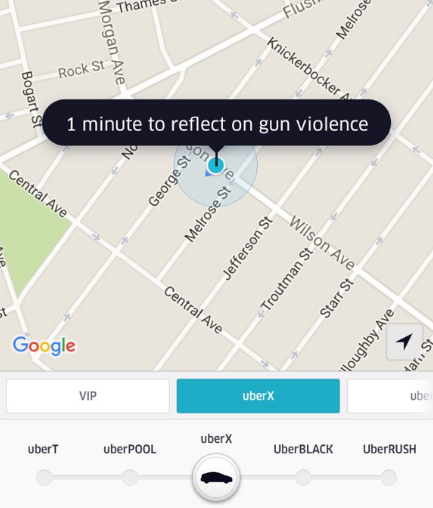 Uber wants its riders to reflect on gun violence, and it’s not being subtle about it at all. After the shootings at a police protest in Dallas, Uber on Friday decked out the app with reminders to think about the incident. It changed the UberX icons to peace signs and enforced a “moment of silence” where nobody could request a ride for one minute. Gun violence is clearly an enormous problem, and it’s easy to understand why Uber wants to raise awareness. But this seems to be the wrong way to go about things. The company said that it changed icons to peace signs in “a show of solidarity to all affected”, but peace signs — even on the app of one of the world’s wealthiest start-ups — aren’t going to change anything. It’s not that a “moment of silence” will cripple anyone’s ride, it’s that the heavy-handed tone and symbolic freeze seem unlikely to make anyone change their minds and take action if they weren’t already going to.